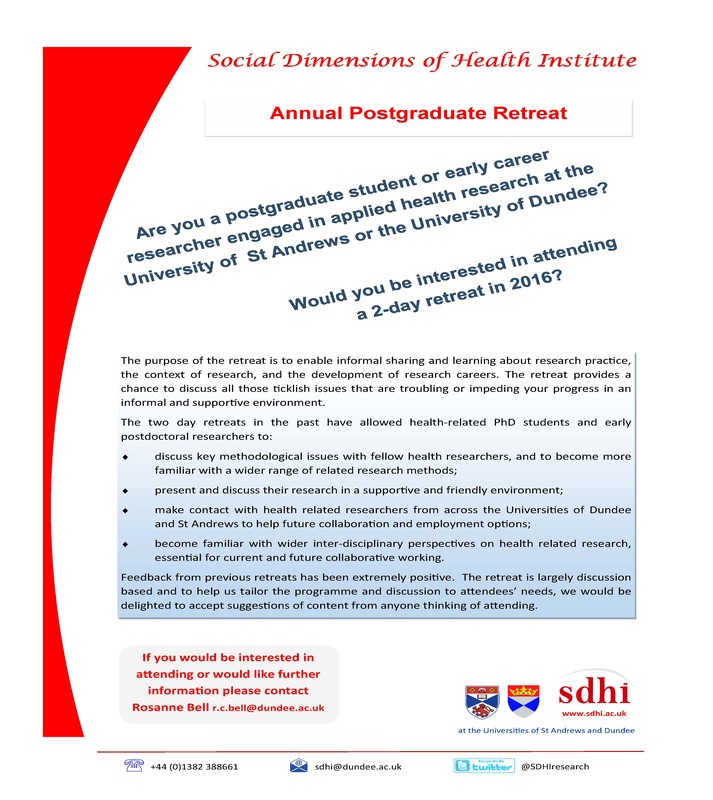 SDHI is planning to host a 2-day retreat in 2016 for postgraduate students and early career researchers engaged in applied health research at the University of St Andrews or the University of Dundee. The exhibition showcases innovative design work of architectural students at the University of Dundee. Over the course of last year, the Architectural Design Unit carried out in-depth research into designing for adults on the Autistic Spectrum. At present there is is shortage of suitable accommodation and facilities for adults with autism in the UK and few published design guidelines. The students identified suitable sites within Dundee that are all currently vacant or earmarked for development. Each student went on to design a housing scheme which also incorporated a social enterprise element which could provide employment opportunities and embed the scheme within the community. 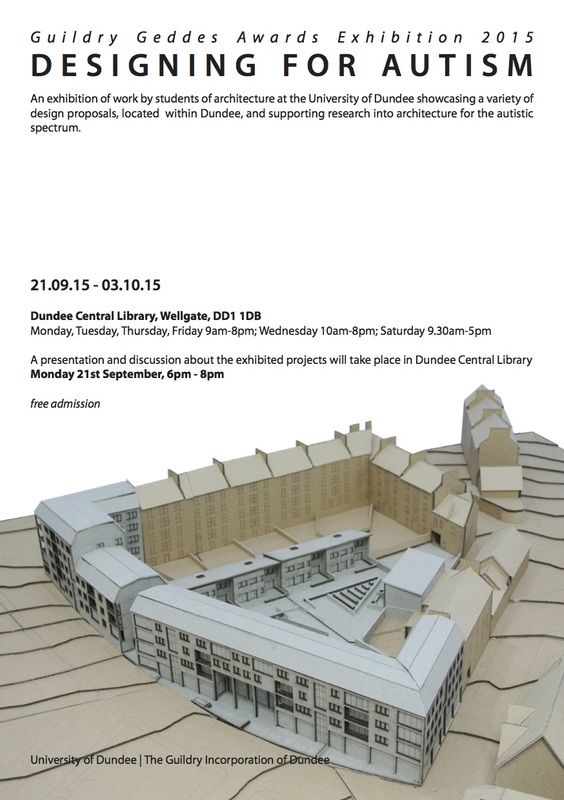 The exhibition takes place in Dundee Central Library, The Wellgate from the 21st September – 3rd October 2015. A presentation and discussion of the project will take place on the opening night Monday 21st September 6-8pm. Ideally these posts will attract health practitioners (with active professional registration) who will have the leadership and credibility to drive forward improvement initiatives and projects across Scotland. SISCC is looking for professionals with a strong background in leadership in a relevant health profession, with knowledge and expertise in both practice, research and/or education and the ability to lead the implementation of evidence-based change. As well as advertising these to the academic community, the posts are being offered as secondment opportunities from health and social care. Dr Wendy Moncur is a Reader in Socio-Digital Interaction at the Duncan of Jordanstone College of Art and Design (DJCAD) at the University of Dundee. Her highly acclaimed work focuses on the design of technology to support ‘being human in a Digital Age’. Wendy has in been affiliated with SDHI for the past year. Apart from bringing rich interdisciplinary working experiences to SDHI, she has also connected us with and instigated valuable collaborations with academic researchers and non-academic partners in Australia and the United States. Professor Tim Croudace is a trained experimental and applied psychologist who is widely published and has worked at various higher education institutions including York and Cambridge before coming to the University of Dundee. His research includes psychometric epidemiology, trials of health care interventions, and clinical evaluations, primarily in mental health but also in other areas of health care. Tim has been affiliated with SDHI since his arrival in Dundee in early 2015. Tim’s work will provide exciting interdisciplinary opportunities, not only in research but also in terms of capacity and capability building in the area of methodological innovation. Professor Alex Baldacchino, accomplished consultant psychiatrist and academic will join us later this year when he takes up a chair in Medicine, Psychiatry and Addictions at the University of St Andrews. Alex is currently NHS Fife Director for Research & Development and recently oversaw the opening of an on-site clinical research unit at the Victoria Hospital in Kirkcaldy in addition to a dedicated research facility in at Queen Margaret Hospital in Dunfermline, Fife. Alex has been connected to SDHI work since the early days of the Institute. In October this year, he will chair the prestigious International Society for Addiction Medicine conference in Dundee. He is also director of the Centre for Addiction Research and Education (CARES) at the University of Dundee. The expansion of the management team is a reflection of the current SDHI strategy and strikes a balance between social science and health-related disciplines, the foundational institutions of SDHI and conceptual and practice focused concerns. Watch this space for further announcements in the near future.